The home of Miss. Goertner E. Mumford (Parkhurst), located in Waynesville, Ga. Mrs. Parkhurst was the daughter and heiress to Mr. and Mrs. Sylvester Mumford. She died in 1946 at Washington D. C., and left nearly a million dollars in trust to be used for the benefit of boys and girls of Brantley County, where once she lived. Picture provided by Earl Knox, son of David Junior Knox. DISASTER: The Brantley Enteprise reported on March 31, that a fire occurred at the Old Mumford house on March 23, 2005, causing severe damage, according to Fire Chief Dru Smith, Nahunta Volunteer Fire Deparment. Officials think the residence was the victim of several severe thunder storms that ranged across the area. Smith said that, while the second floor was gutted, the lower floor did not receive so much damage, and the staircases were pretty much intact, leaving him to speculate that the residence could be rebuilt. The Mumford house was constructed in 1848 by Sylvester Mumford who moved south to open a store to cater to the crowds that visited the mineral springs bathouses in Waynesville during that town's heyday. It was purchased by the grandparents of Shaw McVeigh and ownership is now shared among him and his siblings. It was placed on the National Register of Historic Plaeces June 28, 1982. The only other Brantley Co. structure on the historic register is the courthouse, which was added June 14, 1996. Only one other house in Brantley County is older than the Mumford house, and it also is in Waynesville. 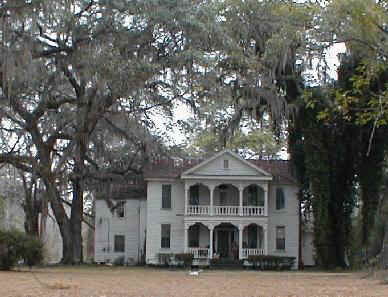 The Lodge Plantation house, located about a mile north of U.S. Highway 82 on Browntown Road was built in 1825. Using research from creditable sources, such as Rev. A. M. McCool, and area writer, Carr McLemore, Mr. Robert L. Hurst of Waycross brought to life the "Story of Miss Goertner Mumford," in "This Magic Wilderness." The Brantley County Historical and Preservation Society, Inc. gives thanks to Mr. Hurst for approval to re-publish this story of historical significance. We also acknowledge the writings of Rev. A. M. McCool that wrote of friendships and personal relationships with the Mumford family, and Mr. Carr McLemore. Goetner E. Mumford was once known as the captivating young plantation heiress who rode a magnificent white stallion, named Prince, and with her dog named, Rover, the explored the white sand hills, fields, and forests surrounding old Waynesville. Appropriately wearing an elegant beaver for this ride, Goetner was described as a very beautiful woman. Rev. McCool describes Mrs. Parkhurst, one of two Mumford daughters, as most unusual, a wonderful and unselfish personality all through her life, kind and thoughtful of all people. She was called affectionately "Miss Goertner" by all her many friends at Waynesville, even after she married Mr. Parkhurst and moved away. The Rev. McCool continues his praise of "Miss Goertner" by pointing out that, though she fell heir to a huge fortune and lived in much different lifestyle in New York and Washington for over 60 years, she was ever mindful to the needs of people in Brantley County. "She remembered the bright young boys and girls of her hometown community. To this end when she, a wealthy woman, made her legal will, she left a huge sum of money for the education of worthy boys and girls of Brantley County, Ga."
In describing his venture into the Mumford estate, Area writer, Carr McLemore, writing in the Jesup Press-Sentinel, November 29, 1980, tells the following: "...farther along, where the vines grow dense, trees grow tall and moss hangs low, one may search for the sites of countless two story dwellings, the sites of many family cemeteries, the Confederate soldiers cemetery where 40 or more were buried, the site of the Waynesville Presbyterian Church... the famed Mineral Springs and the stately Mumford house..." As Mr. McLemore says, one goes through a veritable jungle in search for an old family cemetery. This pictures his remarks. It is one taken at the Hazlehurst plot, found where "the vine grow dense," for sure. Now for the researcher, the question arises: who really lies here? Oh, the names are there, but who were John M. Hazlehurst (1847-1884), Jane Johnston Hazlehurst (1787-1877), Mary Jane Hazlehurst (1822-1878) and Layton Hazlehurst (1820-1882)? Goertner Mumford Parkhurst died in 1946 at age 99 in Washington, D.C.; she left nearly a million dollars in trust to be used for the benefit of boys and girls of Brantley County, where once she lived, according to Reverend A.M. McCool, a friend and neighbor. Rev. McCool selects the Mumford family of Waynesville as a subject for his proposed book because their story, if just one part, would read like a modern novel. See contents of Mrs. Parkhurst's Will & LIST OF SCHOLARSHIPS! Sylvester Mumford came to Waynesville from New York State when he was just a young man. The early 1800s were years of growth, and it was a time for pioneers of the land and in the businesses that would serve these settlers. Before Sylvester Mumford could get into his business, however, he met and fell in love with Miss Theresa Tison, a sister to a Mr. John M. Tison. Sylvester and Theresa were married. He erected a general merchandise in Waynesville, then a bustling community handling the bustling affairs of the large Wayne County. As county seat, it offered many opportunities for a young merchant. Mr. Tison, by the way, had opened a similar concern in Bethel (Georgetown). Since no railroads existed at this time, dry goods were brought up from Brunswick in sailboats on Turtle River, first to Bethel and then to Waynesville by ox cart, tells Rev. McCool. Observing the progress and growth of these two men, the piney woods preacher watched them become immensely wealthy. People, in those days, came to Bethel and Waynesville twice a year for all their household supplies, he informs, indicating that each of these families would do enormous business with the merchants. Rev. McCool, noting further characteristics about the two families, stresses how, even then, civic minded they were. Area writer Carr McLemore, also much impressed with the Mumford -Tison families, wrote that they "lent notable luster to the name of the old county seat, and the Mumford dwelling remains as a symbol of the beauty that prevailed there." Mr. McLemore, who figured Mrs. Parkhurst's endowment in the neighborhood of $600,000, describes the Mumford House as stately. Mrs. Parkhurst, after so long away, is credited with remembering "the beautiful, two story, ante-bellum home sitting luxuriously under the mighty oaks and surrounded by towering, whispering pines." Waynesville, a good distance from the coast during "horse n' buggy days," lent itself to those seaside refugees from Glynn County who made the trek each summer to recuperate at the Mineral Springs. In fact, one of the features on the Mumford Estate is the old swimming pool, brick-bottomed, that allowed the swimmer to rejuvenate himself --hardly ever her -in those days--in the smoothing waters. At least in Waynesville, they were not constantly assaulted by mosquitoes and other summer pests so predominate on the coast. According to an "Inventory of Historical Sites," prepared by the Southeast Georgia Area Planning and Development Commission, the Mumford home, built by Sylvester Mumford in 1848, consisted of a double veranda and much delicate scrollwork. Mr. and Mrs. Ronnie Johns, present caretakers (approximately 1981), pointed out other features as well: the aged wooden pegs, the extremely wide cypress planks paneling the hall and other areas and the staircase with the ornate railings said to have been imported from France. Prior to the Johns' employment, the house, which is about 133 years old at this writing and which was built one year before Mrs. Parkhurst's birth, has been vandalized one or more times. Many of the valuable pieces have disappeared because the house has been left vacant for a long while. The grounds, covering a large acreage, still hold the burial place for both Mr. and Mrs. Mumford, though these graves, too, have not escaped the vandals' touch. "Somewhere nearby on the grounds a magnificent saddle horse, named Prince, a dog named Rover and a whooping crane are buried," adds Reporter McLemore. "Prince was the horse that Gertrude (Goertner) Mumford rode gracefully over the Waynesville 'sand hills,' appropriately wearing an elegant beaver. She was a beautiful woman." Now, a question and a legend unfold. "Just whether Mr. Mumford acquired his fortunes through his stores in the area around Waynesville, or whether he inherited some estates or money in New York is not fully known by the old people in and around Waynesville," continues the rural minister. "This one thing, however, they do know -- that during the terrible War between the States, Mr. Mumford lost his entire fortune; whereupon, he returned immediately to New York State where his friends or relatives backed him again. He, then, came back to Waynesville and began another business that thrived under his management. Most people knew and recognized that he was a man of wealth, but none of them, not even in their wildest dreams --not even his family knew --of his fabulous accumulations during his lifetime. See a Continuation of the Mumford Story in Confederate Gold. Click!! Information assembled by Thomas Earl Cleland, 12564 Dunraven Trail, Jacksonville, Florida 32223.